Gail is part of the JavaFX documentation team and enjoys working on cutting-edge, innovative documentation. Nancy is a technical writer in the JavaFX group. She has a background in content management systems, enterprise server-client software, and XML. She lives on 480 acres in the middle of nowhere with horses, a donkey, dogs, cats, and chickens, and stays connected by satellite. Send us feedback about this document. If you have questions about JavaFX, please go to the forum. This tutorial shows the benefits of using JavaFX FXML, which is an XML-based language that provides the structure for building a user interface separate from the application logic of your code. If you started this document from the beginning, then you have seen how to create a login application using just JavaFX. 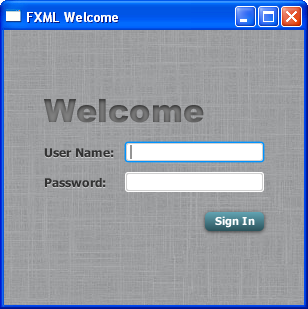 Here, you use FXML to create the same login user interface, separating the application design from the application logic, thereby making the code easier to maintain. The login user interface you build in this tutorial is shown in Figure 4-1. Description of "Figure 4-1 Login User Interface"
This tutorial uses NetBeans IDE. Ensure that the version of NetBeans IDE that you are using supports JavaFX 2.2. See the System Requirements for details. From the File menu, choose New Project. In the JavaFX application category, choose JavaFX FXML Application. Click Next. Name the project FXMLExample and click Finish. FXMLExample.java. This file takes care of the standard Java code required for an FXML application. Sample.fxml. This is the FXML source file in which you define the user interface. SampleController.java. This is the controller file for handling the mouse and keyboard input. Rename SampleController.java to FXMLExampleController.java so that the name is more meaningful for this application. In the Projects window, right-click SampleController.java and choose Refactor then Rename. Enter FXMLExampleController, and click Refactor. Right-click Sample.fxml and choose Rename. Enter fxml_example and click OK. The first file you edit is the FXMLExample.java file. This file includes the code for setting up the application main class and for defining the stage and scene. More specific to FXML, the file uses the FXMLLoader class, which is responsible for loading the FXML source file and returning the resulting object graph. Make the changes shown in bold in Example 4-1. A good practice is to set the height and width of the scene when you create it, in this case 300 by 275; otherwise the scene defaults to the minimum size needed to display its contents. Next, edit the fxml_example.fxml file. This file specifies the user interface that is displayed when the application starts. The first task is to modify the import statements so your code looks like Example 4-2. As in Java, class names can be fully qualified (including the package name), or they can be imported using the import statement, as shown in Example 4-2. If you prefer, you can use specific import statements that refer to classes. The Hello World application generated by NetBeans uses an AnchorPane layout. For the login form, you will use a GridPane layout because it enables you to create a flexible grid of rows and columns in which to lay out controls. Remove the AnchorPane layout and its children and replace it with the GridPane layout in Example 4-3. In this application, the GridPane layout is the root element of the FXML document and as such has two attributes. The fx:controller attribute is required when you specify controller-based event handlers in your markup. The xmlns:fx attribute is always required and specifies the fx namespace. The remainder of the code controls the alignment and spacing of the grid pane. The alignment property changes the default position of the grid from the top left of the scene to the center. The gap properties manage the spacing between the rows and columns, while the padding property manages the space around the edges of the grid pane. As the window is resized, the nodes within the grid pane are resized according to their layout constraints. In this example, the grid remains in the center when you grow or shrink the window. The padding properties ensure there is a padding around the grid when you make the window smaller. Looking back at Figure 4-1, you can see that the login form requires the title “Welcome” and text and password fields for gathering information from the user. The code in Example 4-4 is part of the GridPane layout and must be placed above the </GridPane> statement. The first line creates a Text object and sets its text value to Welcome. The GridPane.columnIndex and GridPane.rowIndex attributes correspond to the placement of the Text control in the grid. The numbering for rows and columns in the grid starts at zero, and the location of the Text control is set to (0,0), meaning it is in the first column of the first row. The GridPane.columnSpan attribute is set to 2, making the Welcome title span two columns in the grid. You will need this extra width later in the tutorial when you add a style sheet to increase the font size of the text to 32 points. The next lines create a Label object with text User Name at column 0, row 1 and a TextField object to the right of it at column 1, row 1. Another Label and PasswordField object are created and added to the grid in a similar fashion. When working with a grid layout, you can display the grid lines, which is useful for debugging purposes. In this case, set the gridLinesVisible property to true by adding the statement <gridLinesVisible>true</gridLinesVisible> right after the <padding></padding> statement. Then, when you run the application, you see the lines for the grid columns and rows as well as the gap properties, as shown in Figure 4-2. 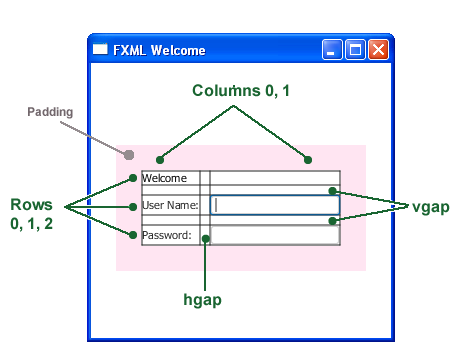 Description of "Figure 4-2 Login Form with Grid Lines"
The final two controls required for the application are a Button control for submitting the data and a Text control for displaying a message when the user presses the button. The code is in Example 4-5. Add this code before </GridPane>. An HBox pane is needed to set an alignment for the button that is different from the default alignment applied to the other controls in the GridPane layout. The alignment property is set to bottom_right, which positions a node at the bottom of the space vertically and at the right edge of the space horizontally. The HBox pane is added to the grid in column 1, row 4. The HBox pane has one child, a Button with text property set to Sign in and an onAction property set to handleSubmitButtonAction(). While FXML is a convenient way to define the structure of an application's user interface, it does not provide a way to implement an application's behavior. You implement the behavior for the handleSubmitButtonAction() method in Java code in the next section of this tutorial, Add Code to Handle an Event. Assigning an fx:id value to an element, as shown in the code for the Text control, creates a variable in the document's namespace, which you can refer to from elsewhere in the code. While not required, defining a controller field helps clarify how the controller and markup are associated. Now make the Text control display a message when the user presses the button. You do this in the FXMLExampleController.java file. Delete the code that NetBeans IDE generated and replace it with the code in Example 4-6. The @FXML annotation is used to tag nonpublic controller member fields and handler methods for use by FXML markup. The handleSubmtButtonAction method sets the actiontarget variable to Sign in button pressed when the user presses the button. You can run the application now to see the complete user interface. Figure 4-3 shows the results when you type text in the two fields and click the Sign in button. If you have any problems, then you can compare your code against the FXMLLogin example. 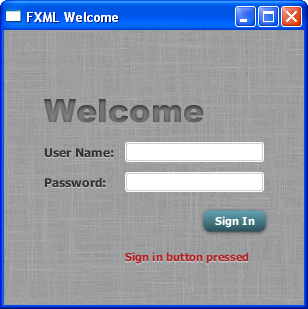 Description of "Figure 4-3 FXML Login Window"
The result is in Figure 4-4. If you are considering using a scripting language with FXML, then note that an IDE might not support stepping through script code during debugging. The final task is to make the login application look attractive by adding a Cascading Style Sheet (CSS). In the Project window, right-click the login folder under Source Packages and choose New, then Other. In the New File dialog box, choose Other, then Cascading Style Sheet and click Next. Enter Login and click Finish. Copy the contents of the Login.css file attached to this document into your CSS file. For a description of the classes in the CSS file, see Fancy Forms with JavaFX CSS. Download the gray, linen-like image for the background in the background.jpg file and add it to the fxmlexample folder. Open the fxml_example.fxml file and add a stylesheets element before the end of the markup for the GridPane layout as shown in Example 4-8. The @ symbol before the name of the style sheet in the URL indicates that the style sheet is in the same directory as the FXML file. To use the root style for the grid pane, add a style class to the markup for the GridPane layout as shown in Example 4-9. Create a welcome-text ID for the Welcome Text object so it uses the style #welcome-text defined in the CSS file, as shown in Example 4-10. Run the application. Figure 4-5 shows the stylized application. 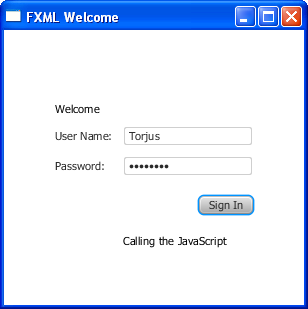 Description of "Figure 4-5 Stylized Login Application"
For information about how to run your application outside NetBeans IDE, see Deploying Your First JavaFX Application. Now that you are familiar with FXML, look at Introduction to FXML, which provides more information on the elements that make up the FXML language. The document is included in the javafx.fxml package in the API documentation at http://docs.oracle.com/javafx/2/api/javafx/fxml/doc-files/introduction_to_fxml.html. You can also try out the JavaFX Scene Builder tool by opening the fxml_example.fxml file in Scene Builder and making modifications. This tool provides a visual layout environment for designing the UI for JavaFX applications and automatically generates the FXML code for the layout. Note that the FXML file might be reformatted when saved. See Getting Started with JavaFX Scene Builder for more information on this tool. The Skinning with CSS and CSS Analyzer section of the JavaFX Scene Builder User Guide also give you information on how you can skin your FXML layout. Copyright © 2008, 2013, Oracle and/or its affiliates. All rights reserved.